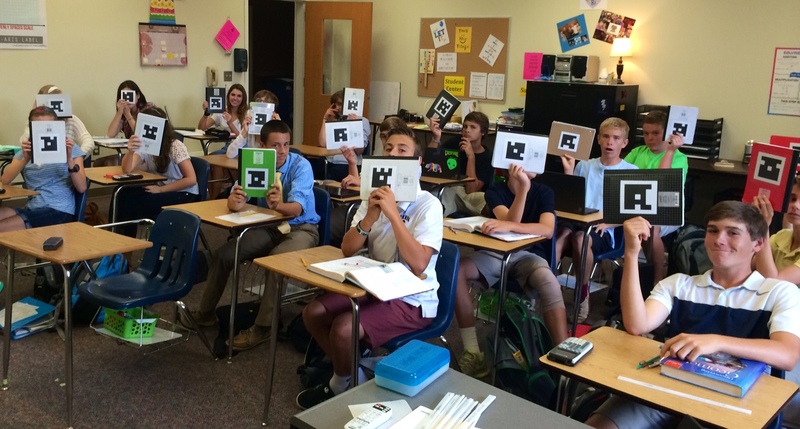 If you want 100% of your students engaged and asking you to do an activity, you need to try Plickers. 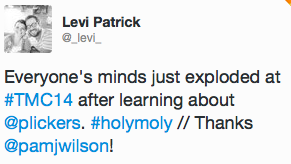 The amazing Pam Wilson introduced us to them at Twitter Math Camp. We were ALL amazed and impressed! A Plicker is a “paper clicker” with a bar code that the students hold up and then you scan with any smartphone or iPad. Only one device needed, no batteries required! The students can pick A, B, C, D or True/False. The data immediately shows up on your phone AND on their website as a bar graph. I assigned my students a number, so I can even see who missed the question as I am scanning the room. From your computer, you can project their responses onto your overhead. It only shows the correct responses in the “Live View”. It also stores the data on their website so you have a record of correct and incorrect answers. I know you think that I must be lying, but I am not. These things are AMAZING. I decided to affix my students Plickers to the back of their INB with clear contact paper. That way, they should always have them handy during class, and hopefully they won’t get destroyed! I oriented them all differently (either A, B, C, or D facing up) on their notebooks so they couldn’t see how other students were holding up their notebooks to get a hint. It’s so much fun for the students and for me! I have been using it as a warm-up, to asses prior knowledge or expose them to a new topic that we will begin that day. I think it would also be a great “Pre-Assessment” or “Exit Ticket” tool. You can see below how other teachers are using them in class as well. If you have an idea about how Plickers could be used, please put it in the comments. Also, if you have blogged about Plickers, please post your link in the comments so that we can all get great new ideas! This entry was posted in Integrating Technology and tagged activities, technology by I Speak Math. Bookmark the permalink. I am so excited to try this! Thank you for sharing. I was so excited to learn about plickers at TMC15. I love the idea of putting the plicker card on the back of the Interactive Math Notebook. My students always have their IMN out on their desk so that will be perfect! Did you use regular contact paper or did you find something with a “matte” finish as recommended on the website? Thanks! Regular contact paper does have a matte finish. It worked beautifully. Great! I can’t wait to try it.